Gas pipeline installation services | Reticulated gas system supplier | tank installation services in gurgaon | gas regulator manufactures | services of hsd tank istallation | Gas Manifold System in india | gas handling equipments supplier in gurgaon. These pigtails are used For applications which require constant handling and flexing, with armor casing provides protection from kinking, braid abrasion or stress at the ends.. 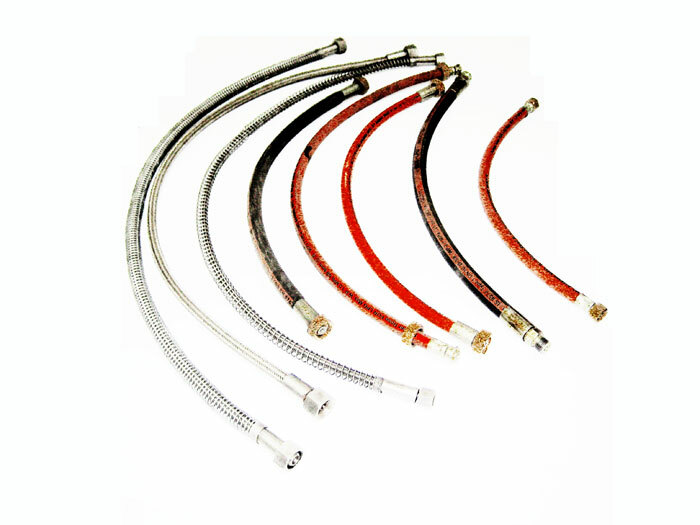 These Pigtails /hose are made as per pressure ratngs ie for Low Pressure 10 to 20 bar & other for 300 bar Basicaly for LPG. the material of construction is nitrile with double brading of fiber or stainless steel. & for industrial Gases the material of construction is teflone double braded with Hydrolic fitings at Bothe ends. Close pitch, high convolution count annular&innercore has excellent flexibility and can withstand continual flexing. we can manufacture these pigtails as per costomer specific requirments for Liquide or gas applications in differnt Pressure & Different sizes.